In 2014 in the Congregational Archives, the Archives Manager Janet Howse came across six black and white photographs which had been put to the side because they were unidentified (only six you say!) At that time, the photographs were documented in a basic fashion so that Archives knew they had them and their location and that is where they stayed until recently. Janet decided to try and solve the puzzle of who, what, where, when, how and why these photographs were taken. In January, without television reception at home for about ten days, over a couple of evenings, she watched one of her favourite television dramas, Shooting the Past, on DVD. First shown by the BBC in 1999, the drama was written by Stephen Poliakoff, and was focused around a photographic library threatened by closure, and the lives of its eccentric staff. While she is not suggesting the Congregational Archives staff is “eccentric,” the drama was about the importance of photographs to people, their identity and what stories the photographs can tell about people’s lives. The six “box Brownie” photographs started to haunt me. The sleuthing began! So back to the mystery six photographs. Working in and with Archives is never straightforward. She has sometimes compared the work of the Archives to that of a detective solving a crime (who, what, where, when, how, why? ), following the clues, piecing together the evidence, which are often fragments of information, together to make a comprehensible explanation and to tell the story. At its basis, archival work is evidential in nature. Archivists make conclusions based on careful examination of the evidence. Where there is conflicting evidence, they endeavour to investigate such differences and make the best possible conclusion, or they note that there is conflicting evidence, which is invariably resolved at a future date. Where this cannot be done, Archivists might say, “It is assumed….” or “It appears to be…” and do not claim something to be factual if we do not have good evidence. It cannot be assumed that photographs 1 to 3 are connected, although they may very well be. 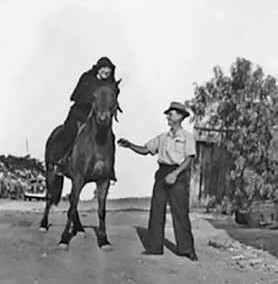 Photograph 1 shows a Sister dressed in the traditional habit on a horse, with a man standing beside the horse looking as if he may take the reins. Why is the Sister on a horse, where is the photograph taken, when was it taken? What are the clues? There is a dark-coloured car in the left background, which appears to be from the 1930s to 1940s. Can we recognise the vegetation near the car? Where were the Sisters during the 1930s and 1940s where this could have been taken? Was it taken at St Finbarr’s in Ashgrove Queensland or the holiday house at Beaconsfield in Victoria? Which Sisters do we know who could ride horses? Photograph 2 shows a young lay woman and two Sisters on the beach, which appears to be on the eastern shores of Port Phillip Bay, Victoria with a pier in the background. Is it Frankston Pier? There has been a pier here since 1857. Is the lay woman a candidate for the Congregation or is she a relative of one of the Sisters? Why are they on the beach? 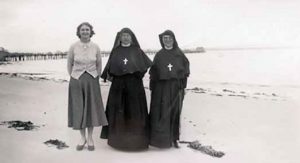 Some Sisters with Melbourne connections have recognised Sr Mary de Chantal Farrell in the centre of the photograph. Sr Mary de Chantal was a nurse in Melbourne for most of the 1940s to the 1960s. This is a significant finding as the Archives did not hold a photograph of Sr Mary de Chantal at all. 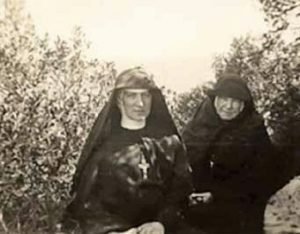 Photograph 3 shows two Sisters in the traditional habit in a garden. How do we recognise the place? Can we identify the Sister on the left as her face is clearer than the Sister on the right? In what time period was the photograph taken? Now we arrive at photographs 4 to 6 (below), which are clearly of the same building with a grotto. Someone in the past has annotated in pencil on the reverse Strathmore, but consultation of photographs of Rosebank House in Strathmore Victoria, which became St Vincent de Paul Convent from 1961 to 1995, shows this photograph does not appear to be of Rosebank House. 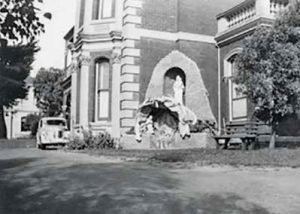 A suggestion was made that it was St Margaret’s Private Hospital in Launceston before the Sisters bought it and it became St Vincent’s Hospital in 1944. The photograph does not resemble this either. A check was made of other properties owned by the Sisters between 1930 and 1970 and no connections have been made. Did the building belong to another Order? Can any Sister help us identify and date these six photographs so we can answer the questions: Who, what, where, when, how and why? And be able to tell the story behind the photographs?